OpenStack Summit is the leading event in Open Infrastructure, bringing together the builders and operators for sessions and workshops on containers, CI/CD, telecom & NFV, public cloud, multi-cloud and more. 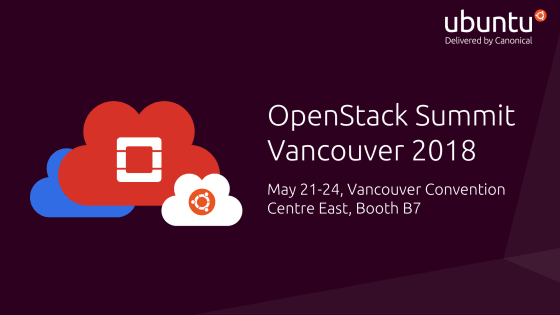 Canonical is excited to be returning to Vancouver for the OpenStack Summit Vancouver. Today, Ubuntu is at the heart of the world’s largest OpenStack clouds, in key sectors such as finance, media, retail and telecommunications. With Ubuntu the number one platform for OpenStack and also the number one platform for public clouds, Canonical is a leader in building and operating multi-clouds. Canonical provides consulting, training, enterprise support and remote operations, to help enterprises focus on what matters most — their applications, not the infrastructure. With the move of compute towards the edge and the emergence of a new class of workloads with AI / ML, building clouds that can adapt to new hardware whether small edge nodes or GPUs is going to be on everyone’s agenda at Openstack Summit. The recent releases of Ubuntu 18.04 LTS, OpenStack Queens, and Canonical’s Distribution of Kubernetes are the perfect match to address these requirements and this will be the opportunity to see them in action. Coming to OpenStack Summit Vancouver? Take a look at some of the demos and keynotes to look forward to! Want to get in touch with our executive team at OpenStack Summit? Fill out the form below and a representative will get back to you as soon as possible.